There is no time like the present to start thinking about your career and post-graduation plans. At Hiatt, we encourage you to visit us early and throughout your time at Brandeis but can certainly meet you wherever you are in the career planning and decision-making process. We offer a wide variety of services, events, workshops and opportunities coupled with strong partnerships with diverse employers from a variety of sectors to support you in building a strong foundation for your professional future. Whether you are in the process of choosing a major or in need of a resume, there are a variety of ways to help you get started utilizing our career counseling staff and resources. Hiatt helps Brandeisians know who they are, what they want, and how to get there. Collaborate with Hiatt to develop personalized strategies to stay flexible in an ever-changing professional world. Meet with us in-person, over the phone, or Skype. We work with all undergraduate students and alumni of undergraduate programs, from your first year when you might be thinking about how majors connect to careers, all the way through senior year and beyond. Hiatt offers free career services for life so no matter where you are after Brandeis, we are here to help you explore new opportunities. New to Hiatt? Get started with a "Welcome to Hiatt" appointment to learn more about us. Alumni can contact our front desk 781-736-3618 to schedule an appointment and access additional web resources on our alumni website. Please note to best serve students and alumni, we offer 1 appointment per week and encourage meeting with the same counselor to develop a relationship and maintain consistency. Drop-ins: Quick questions? Drop in for 15-minute, first-come, first-served meetings during the academic year focused on application material and brief questions (while classes are in session). Monday–Friday, 11 a.m.—4 p.m.
Hiatt Chat: Virtual drop-ins with Hiatt Advisors to get assistance with resumes, LinkedIn, Handshake and more. Monday-Thursday, 8–10 p.m. (while classes are in session). Find HiattChat on Google Chat. Logging into HiattChat for the first time: Sign into your Brandeis email or a Gmail account. In the chat box at the bottom left of your inbox, type hiattchat@gmail.com and select "Invite to chat." Hit "Send invites." Once your invite is accepted, hiattchat will appear in your chat list. 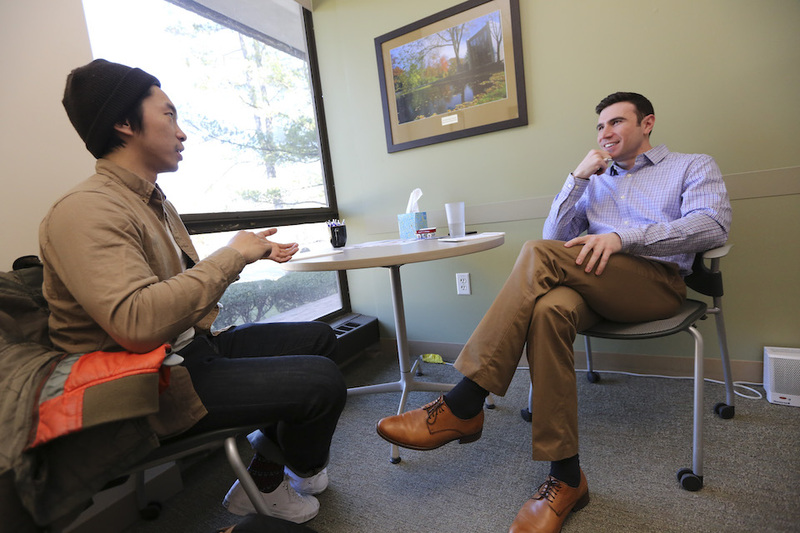 Appointment Preparation: Whether you are preparing for an upcoming appointment or looking for ways to follow-up, here are some tips to ensure you are making the most out of your experience with a counselor. There isn't a one-size-fits-all plan to help you find the information necessary to make informed decisions about your career. Meetings with counselors vary based on your needs. You might meet with someone once, or once a week for several weeks, depending on what you want to discuss. To help us collaborate with you on this process, counselors often begin by getting to know more about you and your interests to help you build on skills or connect you to resources. We regularly host a number of robust programs from small group conversations to active sessions to help guide and equip you with the necessary skills to be successful in the future. Look for programs including resume writing, applying to graduate/law school, internship searches (domestic and international), funding your internship program connecting majors to careers and many more. View current offerings in Handshake. Handshake is your one-stop-shop for accessing career information, job and internship postings, events and more. 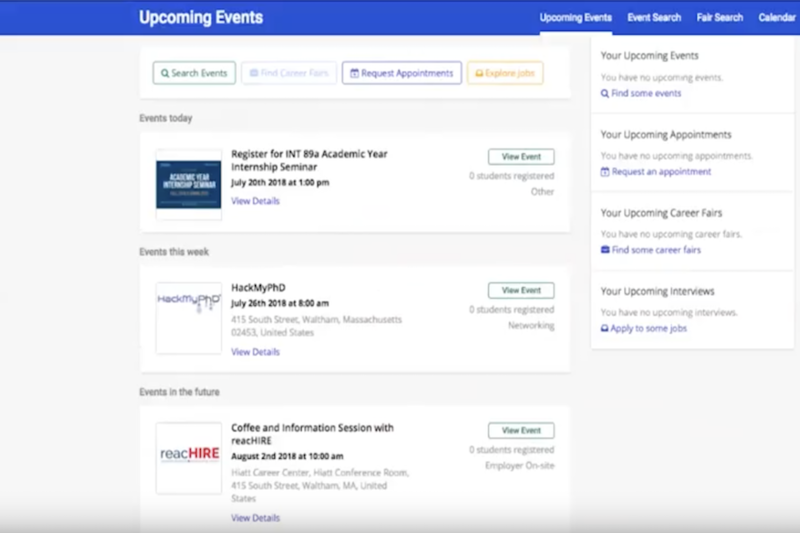 Within Handshake you will find a library of career-related resources, just for Brandeis students, to help you learn more about yourself, explore your field(s) of interest, prepare for interviews, and more. Login to Handshake and click on "Career Center" and "Resources" to access them. For additional information and tips on how to make the most out of your Handshake profile, visit the Handshake Student Help Center. There are many ways to discover who you are and what you want to do throughout your experiences here at Brandeis. As you begin to start to shape your career plans, it’s important to take a step back and evaluate your interests, skills, knowledge and motivations. Hiatt partners with local and national non-profit and for profit organizations in a variety of industries to create opportunities for Brandeis students. Nearly 20,000 organizations list part-time and full-time internships and jobs from all across the county in Handshake. These organizations are specifically looking for Brandeis talent. Start searching for your next opportunity. 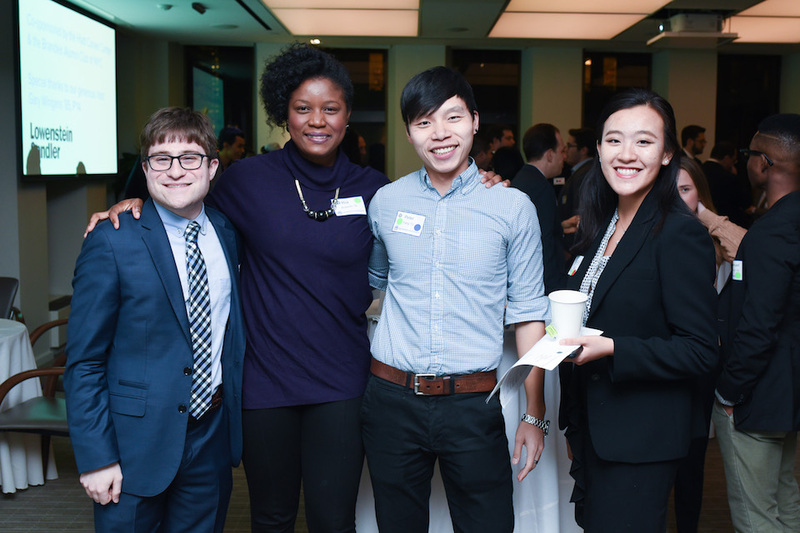 Industry-specific events give you an opportunity to meet Brandeis alumni and industry professionals to learn more about fields and make connections. Alumni offer first-hand information on the transition from Brandies to work. Hiatt has held industry nights for industries including: Business, Consulting & Finance, Health & Biotech and Marketing. Find current events in Handshake. Meet an employer face-to-face at an information session or employer spotlight table. Employers will share information about their organization, upcoming application deadlines, and answer any questions you may have. Find current events in Handshake. Some organizations schedule interviews right on campus, allowing you to interview with a wide-range of employers without having to travel. Explore opportunities and sign up for on-campus interviews with an employer through Handshake. 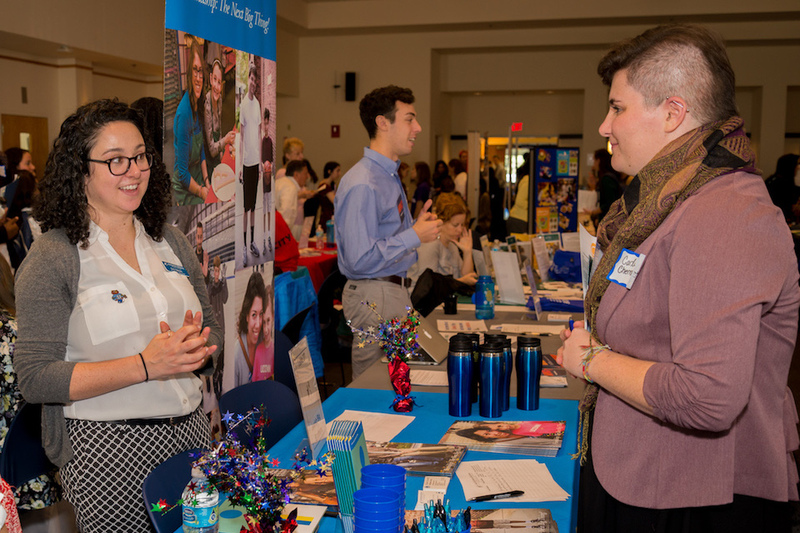 Brandeis works to bring a variety of organizations to campus for career fairs. This is your opportunity to meet with employers, express interest in positions and make connections. Past fairs have included the Computer Science Fair, Social Impact Job, Internships & Volunteer fair, and the Just In Time Job & Internship Fair. Find upcoming fairs on and off campus in Handshake. To meet recruiters in a destination city closer to where you wish to work or intern, consider attending the Career and Internship Connection Fairs in a top destination city. Over winter break, attend a networking night in New York City or Washington, DC to meet with alumni and parents that are eager to speak with you. Over the past years, both events have hosted 200+ attendees combined, providing you with many different people to network and follow-up with. Wisdom Wanted ads are specific requests for career advice that the Hiatt Career Center sends to our volunteer list on a quarterly basis. Students and alumni can write ads seeking advice on a variety of topics, from grad school applications to job opportunities in a specific field. Submit your ad here. Many Brandeisians are active on LinkedIn. Start by fostering connections where you can find advice, hone on their experience and expand your network. Use these videos as a guide on how to make the most of your profile and how to properly network. Finally, join the Brandeis University Career Connections group to see what other advice you can gain.